When I was a kid my brother and I fought over who got first pick of our Flintstone vitamins. We were fighting, of course, over which colour we got each morning. Taking that vitamin was not a challenge for us since they so very closely resembled candy and that was definitely in our wheelhouse. I am comfortable in saying I wouldn’t give my child that kind of vitamin these days given the type of ingredients generally found in children’s supplements (sugar, artificial flavours and colours and gelatin to name just a few). 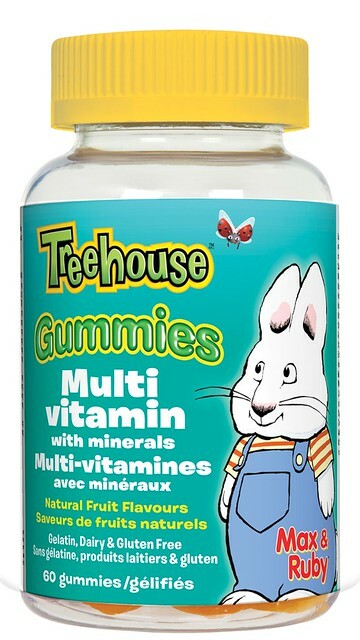 However, having vegetarian children while living in the great white north does make me want to provide them with some supplementation, especially B12 and vitamin D.
I was given a variety of Treehouse Vitamin Gummies to try out and I have to say they are a big hit around here for both my son and for me. I also spoke to Naturopathic Doctor Joyce Johnson who pointed out that while the gummie variety of vitamin may contain a bit of sugar (in this case evaporated cane juice), they appeal to most children, and this comes in handy if a child is resistant to taking supplements. She also pointed out that while the multi-vitamin option is a great overall supplement, in the germy cold and flu months it is advisable to take extra vitamin C and D3. I had assumed that a multi would cover the bases so this was particularly informative for me. 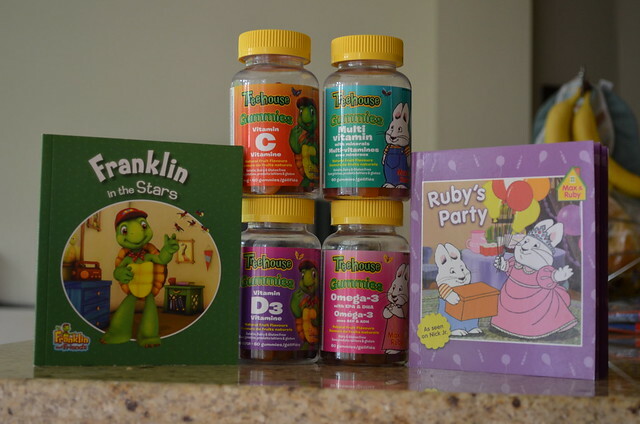 My son loved these vitamins. And I mean loved them. He is used to taking a hard chewable and I don’t know if I will ever be able to go back to that form of vitamin again. I will definitely be stocking up on these once our supply runs out and will be giving them to the baby once I am sure she will chew it a bit before swallowing. Treehouse Vitamins is currently running a fantastic contest and two lucky families of four could win an all expenses paid trip to an incredible looking resort in Mexico. For all the details, please visit www.treehousevitamins.ca. Treehouse Gummies are available at major pharmacies and grocery stores as well as online and retail for approximately $7.99 CDN. Cold and Flu season is almost upon us so if you are in the market for a high quality affordable vitamin for your kids check out Treehouse Vitamin Gummies. 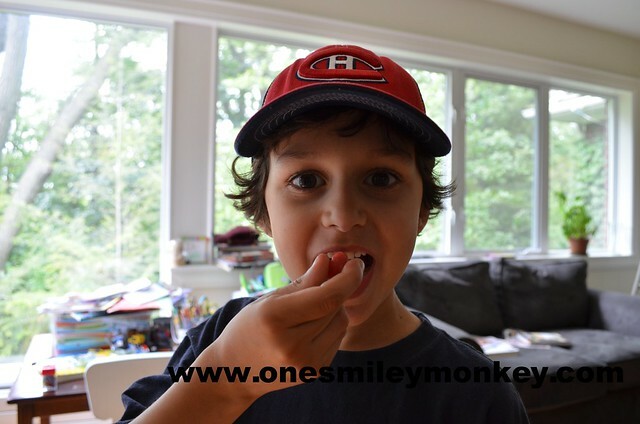 Win it: Canadians, do you want to try Treehouse Gummies for your kids? Enter to win $50 of coupons for Webber Naturals products via Rafflecopter below. Good Luck! I’ve been taking vitamins for quite some time…..my girl, it’s a little new to her routine. I don’t but think I should start. I have been taking vitamins for quite a while now and it is essential to me to take vitamin D too. Yes to both, but not regularly. Need to get better with remembering! I took multivitamins as child and continue to do so daily now. We have vitamins in the house but aren’t regular in giving them to our kids. I take vitamins every day. My parents made me take fish oil tablets as a child and that’s something I’ve passed on. Yes, I take a multivitamin everyday and I also give them to my children! Thanks for the giveaway! Yes, I take multivitamins everyday and give them to my children as well. I do give my kids vitamins and I take multi vitamins myself. I buy gummies ones (usually kirkland) for my kids and I DO HAVE multivitamins for hubby and I, but rearely remember to take them – I also use Halls vitamin C candies, as I work with kids, so having a good immune system is important! My kids and I both take vitamins. I take vitamins and give my kids vitamins. my whole family takes vitamins ! All of my family do take vitamins. Yes, the whole family takes vitamins daily. Yes my whole family takes them. I take vitamins everyday and so do my some loved ones. The kids do. I have multivitamins for the kids and also for hubby and me. We forget sometimes but we do take them when we remember. The kids take on a regular basis more than I do. I take them myself and my children take a multivitamin. Although in the summer I think they get enough fresh fruits and vegetables to get what they need in their diet. It’s winter that I’m not so sure about. my daughter takes the treehouse multi-vitamin and I take vit c and d whenever I remember to take it. My kids take them and I take them sporadically. Yes, our whole family takes a daily multivitamin. I tried getting gummy vitamins before for my son. I take multivitamins usually when I know a well balanced meals are not available. I used to but not any more. I need to get back into doing that. My boys and me both take vitamins! I take vitamins and the kids get them too. Yes everyone in my family takes a multi vitamin. We are pretty consistent with vitamin d, and a multi vitamin sometimes. We all take our vitamins daily just as an extra boost. Best to get them through your food though..
We try to get in a multivitamin and Vit D everyday. We like to take a muti-vitamin once daily and also a vitamin D.
Just Vitamin D right now, but I am taking Prenatal vitamins. I give them to the kids but i don’t take them as often as i should. Right now none of us are taking vitamins, but I know we should. We all take a multivitamin. Thanks for this. I do take them myself…I have to admit I love the gummy vitamins!